I heard on DC 101 that the Washington CAPS were hosting an event called So Kids Can KaBOOM! 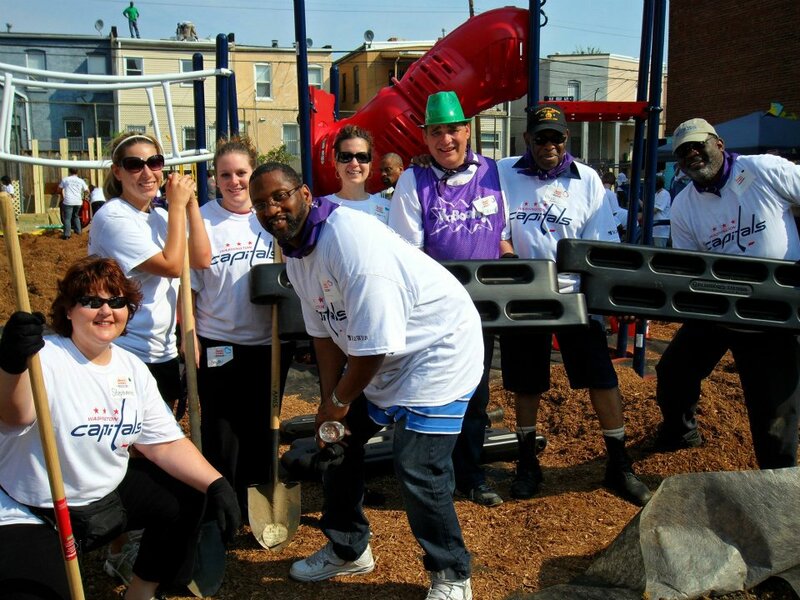 Playground Build. I HAD to be part of it — it involved my two favorite things, hockey and volunteer work! I immediately signed up online. The build took place in DC on the grounds of the Associates for Renewals in Education (ARE). I was on the heart team (see photo above). I’m standing next to our team leader Mike in the green plastic hat. All the team leaders wore kooky hats so you could easily identify them. Our first task was to dig ditches around the entire playground perimeter, breaking up asphalt and clay and inserting Leggo-like beams that created the playground border. Our final task was mixing cement and poring it into holes to secure all the new playground equipment. Two hundred volunteers helped to make the event a success, 7 tons of mulch were hauled in wheelbarrows and spread around to create the playground floor, and 145 cubic yards of cement were mixed and poured. In addition to the central playground area — 3 adult picnic tables were built; 1 shade structure, 3 trellis planter benches, 4 mendocino benches, 3 tabletop games, and 1 GIANT mural. A fun and fulfilling day.